The first one is that solutions need to support campaigns that are more targeted and relevant. You could also say “less annoying,” because unfortunately that’s how many consumers still perceive the information, promotions, and offers they receive. The good news: Businesses are recognizing they need to improve this and every other aspect of the customer experience. It topped the list of business priorities companies have set themselves for 2016 in a recent multi-country Accenture survey. The second meta-trend is that technology needs to do a better job at making marketing and advertising manageable on a multi-country (and often global) scale. Specifically, I’m talking about automating activities. How are these two developments shaking out – and will continue to do so – in the marketing and advertising reality? There has been a shift from the old 360-degree view of the customer to tracking customer behavior at any given moment. But collecting all of this data can be tedious to manage. Rather than requiring a full team of data scientists to build models, more companies are moving to robust software powered by artificial intelligence and machine learning (with human oversight), which can be refreshed more often and at a lower cost. Advanced analytics automation software can manage thousands of models – impossible for a data scientist to manage manually. These models can be used to drive improved personalization, predictive scoring, triggered campaigns, programmatic/real-time bidding, yield optimization, etc. Marketers are spending more than ever to make advertising feel more like a contextual experience across all channels. In programmatic marketing, global brands are already shifting from standard display ad formats to Native ad formats and Rich Media ad formats. Despite potential consumer transparency risks, high engagement rates will create an increased blur in the line between ads and content. Taking it a step further, some platforms, publishers, and companies are beginning to experiment with virtual reality…a hot trend this year according to Fjord’s recent 2016 trends report. As programmatic and data-driven media buying exploded from 2014-2015, marketers realized that the work to target the right user from a media perspective wouldn’t pay off if everyone still received the same message or offer. Most of the players in the dynamic creative space have been primarily focused on “traditional” banner ads, only now moving to video capabilities. A huge part of the ad market is moving from buying ads on traditional TV (targeting wide audiences with general messages) to buying tightly targeted audiences to deliver relevant video ads across multiple devices. US mobile programmatic ad spending is expected to more than double to $9.33bn compared to last year, according to eMarketer, accounting for around 60% of programmatic ad display spending. Everything that’s not related to a mobile-first approach will be put on the back-burner, as mobile programmatic will grow at double digit rates globally. We’ve all been there as marketers in a personalized ad world, but customers can’t have their cake and eat it too. We are seeing customers increasingly annoyed with their behavior being tracked, and yet they don’t want to be bombarded with ads that aren’t relevant. The problem is becoming much bigger than industry analysts predicted. In fact, 28% of US Internet users use ad-blocking software, according to Adobe – bad news for marketers, advertisers and publishers alike, who lose money on browsers blocking ads from reaching the ad server. Invest in non-intrusive formats, such as search, custom ads, sponsored content and social advertising to grow. Invest in major players that have aligned with the ad blockers to develop less intrusive ad formats. Invest in creative and content production for ads. And leverage programmatic with a heavy analytics layer to filter out non-human and non-viewable impressions. What I’ve outlined above will be happening in an environment of the continued globalization of marketing operations and martech/ad tech. Companies are moving towards globally managed technology and processes in order to simplify management and take out costs. Leading vendors of integrated marketing platforms are coming up with integrated solutions and making acquisitions to be able to offer a full range of services (e.g., data and advanced analytics services). However, marketing leaders still need to be prepared for the occasional bump in the road. For example, it behooves IT and marketing organizations to be able to share learnings and best practices across a unified technology stack. But customer and prospect data will remain siloed by region, as global data sharing policies continue to tighten. 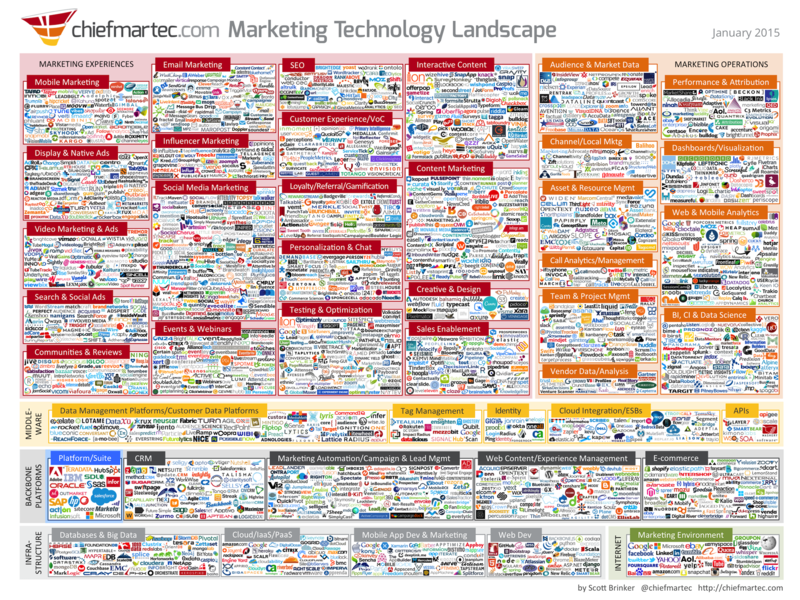 Regardless of how harmonic the martech/ad tech marriage will be, 2016 will see quite a bit of change in this department. It’s all about how marketers will take advantage of it to improve the experience for the customer – during a time in which brands are undergoing a huge transformation and the rules of loyalty are being redefined.